What better than to try barbecue lamb kofte kebabs I thought when my wife came home from the butcher with minced lamb. I always think of Turkey or Greece and lamb when eating kofte and it's fair to say that's not far from typical although the origins of the word are in fact Persian and mean "mashed". So really anything can be considered kofte, not just lamb. For this recipe though I'm going with lamb and serving my barbecue lambe kofte kebabs in what I would consider to be a typical Turkish / Greek way with warm pitta breads, salad and a big dollop of organic natural yogurt or tzaziki - Fantastic! . What's the difference between a lamb kofte and lamb burger? Well frankly not a lot other than I wouldn't put breadcrumb into a burger as I have into this recipe, other than that it's all about the seasoning. As with any pattie the key to keeping it moist and having good flavour is to have a good fat content in the pattie (approx 30%) and for this reason I like to use lamb shoulder. 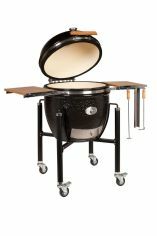 Cooking anything with minced meat on the barbecue however presents its challenges, namely how to stop your patties breaking up and falling through the grill rack and into the coals. Well, I've discovered the Teflon® barbecue mat to be the perfect solution. Just brush with oil. After cooking, wipe down with a damp cloth and put it in the dishwasher - magic! I keep barbecue mat available for these types of recipe and I have another one that is dedicated to vegetarian recipes so that when I have vegetarian guests they can enjoy the barbecue safe in the knowledge that their food has not been cooked on the same grill as meat. Another good way is to add an egg to the ingredients. I accept that an egg could make the final cooked patties quite firm but given the number of ingredients in the mix (including breadcrumbs) I think it worthy of inclusion. If you want to make your pitta from the base ingredients that you can do so in 2½ hours by following my pitta bread recipe and then you can get on with the rest of this recipe whilst the bread is proving. Next is to prepare the tzaziki which can be done in 10 minutes or so. Once finished, put this in the refrigerator for as long as you can spare so that the flavours have the best chance to mingle. To start on the barbecue lamb kofte kebabs, soak the bread in water, squeeze and leave to dry in the mixing bowl. 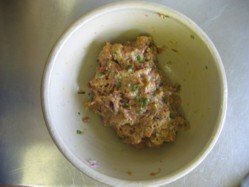 Mix the lamb with the bread and all the other ingredients (except for the oil) in a mixing bowl, get your hands in and give it a good mulch around. Note:- Wetting your hands prior to forming the patties will make life easier because the meat will not stick to your hands. Wet your hands and then form the mixture into small patties. 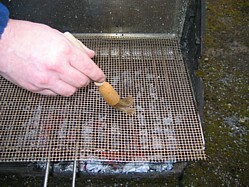 Brush your Teflon® barbecue mat with the oil (sparingly otherwise you'll have a flare up) and place the patties over medium coals for about 15 - 20 minute. Turn them at half time. This is ground lamb so you have to make sure that it is cooked through and the sure fire way to do this is with an instant read temperature probe. 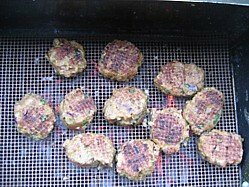 Barbecue lamb kofte kebabs are properly cooked when they reach 75°C (170°F), it is not acceptable to serve a pattie that is pink in the middle. When cooked, remove the barbecue lamb kofte kebabs from the grill, put them to one side to rest for five minutes and place the pitta breads on the grill to warm through. You want them warm and soft and not burned and crispy so keep your eye on them. With a clean tea towel in one hand, take a pitta and slice into it to make a pocket. Take care when doing this because you can get a pocket of steam build up in the pitta bread which could scald you when you puncture it, the tea towel will protect your hand. Fill your pitta half way with salad, then put in one or two lamb koftes and top off with tzaziki. The only other thing you need now is a napkin because eating a kebab can be a messy job!